A man was arrested after stealing a crucifix from a funeral home in Vero Beach, Florida. VERO BEACH – A man broke into Strunk Funeral Home and stole a wooden crucifix and a couple of necklaces, according to the Vero Beach Police Department. Officers were dispatched to 917 17th Street in Vero Beach about a burglary in progress. Two employees told police that after they returned from a job, they saw the garage door opened and a man walking around the building. 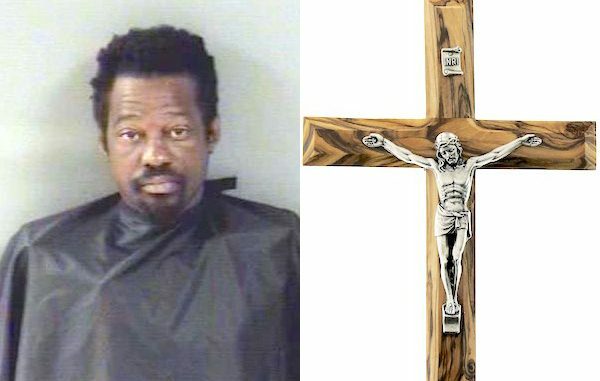 Police found the man, identified as 43-year-old Kevin Antonio Odom, trying to leave on a bicycle with a wooden crucifix. The two employees recognized the crucifix as one belonging to the funeral home, according to the report. Officers then noticed some beads and a Buddhist necklace charm around Odom’s neck, which the employees also said belonged to Strunk Funeral Home. Odom, who is homeless but works as a salesperson, told police that he never broke in, the garage door was open. “It was open like that when I saw it,” explained Odom, according to the affidavit. Police determined that Odom gained entry through the garage by using a door opener from an unlocked vehicle. Odom was arrested and charged with Trespassing, Felony Burglary, and Theft. His bond was set at $31,000.